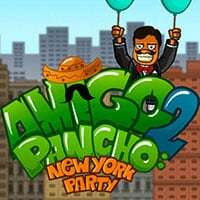 Amigo returns in Amigo Pancho 2! Clear the way so Amigo can escape! Avoid the balloon-bursting hazards to make him fly to the sky. Click on the objects to remove them. Fly high with Amigo and his balloon-powered dreams! Help Amigo Pancho get to the top. Use your problem-solving skills to keep the evil aliens from popping his balloons and destroying his dreams! Click to remove wooden boxes and planks without letting the deadly spikes make contact with Pancho or his helium. Enjoy and have fun in playing this free online mobile puzzle game. Amigo Pancho 2 is a free online puzzle game on Round Games.